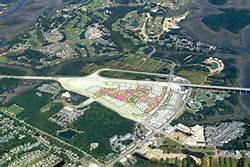 Meg's Daniel Island | Gateway to the community. It’s finally here! The release of the long awaited Captain’s Island lots is happening this Saturday Oct. 14th – and they are something else! Private amenities include a kayak launch and a gathering place exclusively reserved for Captain’s Island residents. This 100 acre parcel was formerly known as Rhoden’s Island and is surrounded by Ralston Creek and the Wando River in Daniel Island Park. While Daniel Island has many unique and beautiful locations, I truly believe that the sites on this new development are the best ever offered. Click below for more information and a great video, and I will be happy to tour them with you. Just give me a call at 843-475-6007 and allow me to show you a glimpse of Daniel Island at its most spectacular! 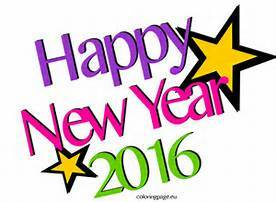 Hello all and a very belated Happy New Year and an early Happy Valentines Day! My apologies for not blogging as often but life is busy on Daniel Island with lots of new growth both in population and development. It seems that almost everyday I see a new face, or a new place to shop or eat here on the island. These are exciting times on Daniel Island! 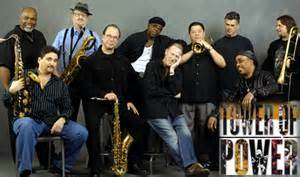 Tower of Power, one of my favorite funk + soul bands of all time is coming to the Charleston Music Hall on Friday October 28th! I’ve already got my tickets and am bringing some friends to what is sure to be a power packed show. I have seen the band many times and Steve and I can attest that it’s always a blast to see these soulful legends. The Charleston Music Hall (http://charlestonmusichall.com) is a great venue located downtown on John St., right next door to Rue de Jean. They really have amped up their bookings over the last year or two and it is one of the many jewels that Charleston has to offer. Great sight lines, great acoustics, and you can even take a beverage with you inside to enjoy during the show. Hope to see you on October 28th and come bring the funk! Yup, that’s me doing most of the rowing while “Captain” Steve steers but what a blast we had! 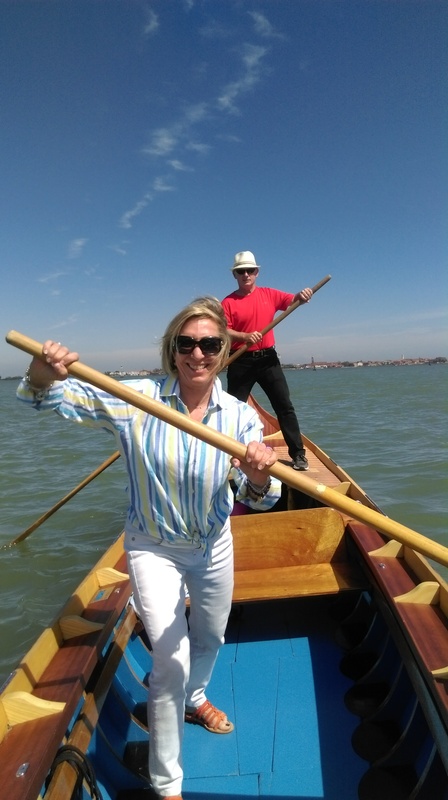 This photo is from a recent trip we took to Italy and in lieu of taking the touristy gondola ride, we decided to learn the techniques of rowing a gondola on our own. Thanks to a Google search titled “How not to get ripped off on a gondola ride,” we came across a company called Row Venice (http://rowvenice.org). Trip Advisor reviews were exemplary so we decided to go ahead and book a 90 minute lesson. Row Venice is a non-profit, largely female led organization dedicated to promoting and preserving the art of voga alla veneta, the style of rowing made famous by gondoliers. Believe me, it was big fun but also a nice workout and we were able to paddle through narrow canals as well as in the Venice lagoon. Our instructor Lisa, was fabulous, patient, and even sang opera. She is a Texan transplant and offered many other tips on how best to enjoy Venice. After our lesson, we really appreciated the skills required by gondoliers and spent about the same amount of money as we would have spent on a 20 minute ride. So if you find yourself in Venice and are feeling the effects of too much pasta, bread, and vino, I highly recommend experiencing Row Venice as a way to burn off some calories. And while neither of us fell overboard, it was a nice lesson on teamwork and agility. It was fun switching positions between steering and rowing and somehow we made it through the entire lesson without a spill. Plus, the lunch afterwards on a quiet canal was well-earned as we recapped our adventure over the obligatory bread, pasta, and vino. Why call Daniel Island home? 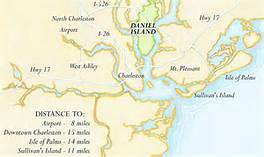 Granted, I’m in the business of selling Daniel Island as a home. Steve and I have been living here for over 10 years and truly feel it is home, but it’s always a challenge to present it to a newcomer looking for a place to call home. This 3 minute video does a great job in presenting a variety of reasons why people have chosen to live on Daniel Island. Feel free to pass it on to anyone looking for a place to call home, I’ll be glad to help them! Here’s a little tip a friend turned me onto recently. Did you know that your local utility company (SCE+G) will come to your home and conduct a complimentary home energy audit? A professionally trained member of the SCE&G Energy Team will walk through your home with you, visually inspecting windows and doors, caulking, weather stripping, insulation levels, appliances, water heaters, heating and cooling systems. This allows them to assess your home’s energy efficiency and usually takes about an hour. They look under your house and crawl around your attic and afterwards provide you with a check list of their recommendations. Once a year you can schedule their assessment and I heartily endorse their work. Ron Cerrudo named South Carolina’s top teaching pro! Congratulations to Ron Cerrudo! 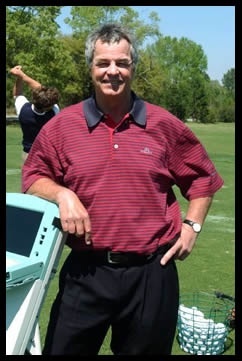 Ron is the Director of Golf Instruction at the Daniel Island Club and recently selected as the best golf instructor in the state of South Carolina. The ranking is published by Golf Digest with more than 1,100 industry teachers participating in the voting. The panel ranks the top teachers by state and the top 50 teachers in the country. So the next time you get the case of the yips or shanks, give Ron a call and have him tweak a thing or two in your game. It could be your grip, your alignment, or your medulla oblongata. Whatever troubles your golf game, Ron will figure it out and fix it. And rest assured you will share a couple of laughs along the way. Congrats Ron, it’s an honor to have you represent the DI Club!